NEW BRUNSWICK, NJ – Mention a noise ordinance violations is most any college town such as New Brunswick and people probably think of rowdy student parties. Yet each month city council members are asked to approve requests for relaxing the noise ordinance, not for late night college kids, but for an early morning activity – construction and cranes. 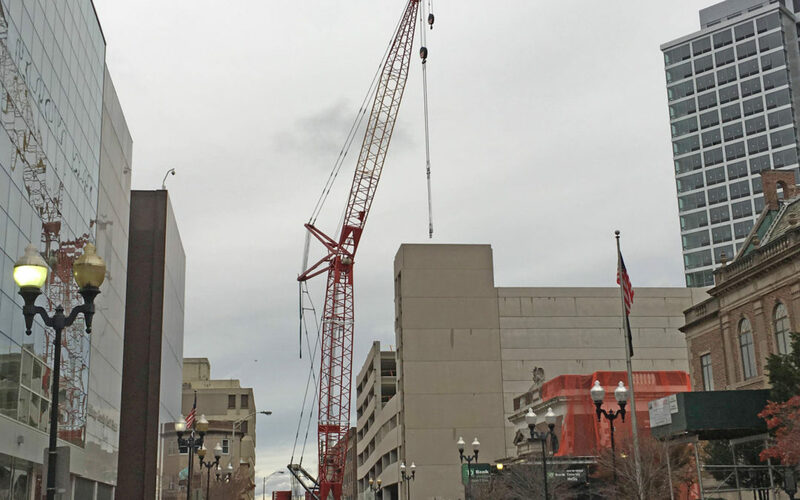 At nearly every one of the twice-monthly council meetings, the city’s elected leaders vote on resolutions to close roads and wave noise regulations for companies using cranes. At the meeting last week, council members approved a total of five resolutions permitting the weekend work and street closing. Many of the projects are for cranes to raise heating and air conditioning units on to roofs of new buildings, or to lift roofing materials, said city business administrator Thomas Loughlin. “That’s progress,” Loughlin said, referring to the work as a sign of the redevelopment across New Brunswick. Under the resolutions approved at the recent meeting, construction work was permitted to start at 7 a.m. on Sunday, Nov. 18., for the continuing work on the parking garage on Bayard Street, next to the work being done for the expansion of the Performing Arts Center. Work was allowed to start at 6 a.m. on a Saturday last month with a crane at Robert Wood Johnson University Hospital, where new roofing material was being lifted into place. Starting times for other projects was at 8 a.m.